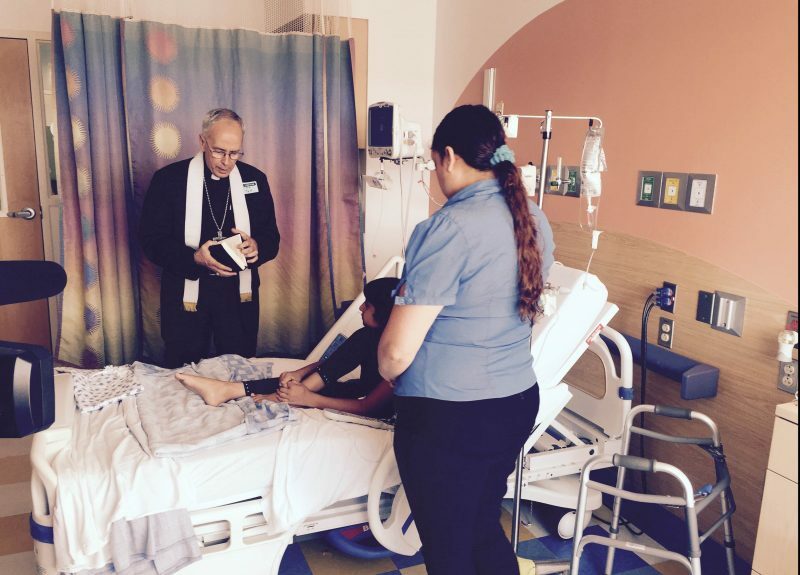 WASHINGTON (CNS) — After hearing about the plight of a cancer-stricken child whose mother was facing imminent deportation, a U.S. border bishop, Texas Bishop Mark J. Seitz of El Paso, decided to pay the pair a visit at the hospital. On Aug. 7, he prayed at a Texas hospital with bed-ridden 8-year-old Alia Escobedo, suffering from bone cancer, and her mother Maria De Loera, the child’s only caretaker, before heading to a meeting with immigration officials — a hearing in which the mother was to report for deportation but one which the bishop attended in her place. At the hospital, he said, he read Scriptures with the mother and daughter, who are Catholic, and prayed. He said he tried to reassure the mother that there were a lot of people trying to help. The last two and half years have been filled, not just with treatments at the hospital, but also with the threat of deportation. An asylum request De Loera filed in 2014 was denied the following year, and since then, she has been in the process of being removed from the country by immigration officials. Bishop Seitz, along with other clergy, accompanied De Loera’s lawyer to see officials from U.S. Immigration and Customs Enforcement, also known as ICE, “to reconsider … given the circumstances,” he said. He said he met with a case worker and a supervisor as well as other officials. “I think they were relatively receptive,” he said. On Aug. 8, ICE officials granted De Loera a six-month stay to continue watching over her daughter during treatment, said Dylan Corbett, executive director of the Hope Border Institute, which also has been involved calling in attention to the case. At her daughter’s bedside, De Loera wears an ICE-issued ankle monitor to track her location even though she has not committed a crime and arrived seeking asylum, Corbett said. Bishop Seitz made headlines in July because of a pastoral letter in which he denounced the “demonization of immigrants” and pleaded with others for compassion and solidarity. He said he’s aware that even among Catholics, the issue of immigration can spark disagreement. Jesus, he said, spoke to questions of law and recognized that there is the law of God and human laws, and human laws can be good or they can be bad. He also asked others to think about the circumstances that lead others to flee their native countries.